Face Foam is a super gentle cleanser with a creamy feeling foam texture infused with a bevy of great actives to tone and smooth your skin. It's perfect for a wide variety of skin types (from sensitive, combination and oily)! Light but effective, this essential oil free cleanser won't strip your skin or mess with the delicate acid mantle which protects your face. Completely unscented and essential oil free, this luxurious foamy gentle cleanser will solve your cleansing needs. It's also lake and ocean friendly! Want to know what the three active ingredients in Face Foam do? Here you go! Apple Cider Vinegar: used to brighten the skin and even out texture. The acidity of the vinegar will help dry out over-active sebaceous glands. High in potassium and malic acid, it is useful for diminishing sun spots and other dark spots. Apple Cider Vinegar also has an amazing ability to naturally balance your skin’s pH without disturbing the acid mantle, which is the film-like barrier that protects your skin from the elements. Bamboo: the silica from bamboo extract improves skin health by helping the body absorb essential minerals such magnesium, zinc, and copper (all found in our Face Food). Bamboo extract also soothes the skin by imparting anti-irritant properties. White Willow Bark • anti-bacterial and natural exfoliating agent. Bamboo • helps soften skin. Apple Cider Vinegar • gently brightens skin. Pump 2 to 3 times on to your hands or sponge and gently rub in circular motions on damp face. Rinse with off with water or a warm wash cloth. Follow up with your favorite moisturizer. It cleans and my skin doesn't break out. The company seems awesome. Amazing for daily use. Does not dry or irritate the skin. During winter recommending to wash face more gently as the skin tends to be dryer. It feels great in the morning and night after washing my skin. My skin seems on the drier side so I want to try the aloe milk cleanser next. Hi Annie, if your skin is more on the dry side the Aloe Milk Cleanser or our Keto Cleanse would be great options for you! Love this foaming cleanser! Gentle and great for preventing blemishes. So happy you and your skin love our Face Foam! Hard working and skin smoothing face wash! 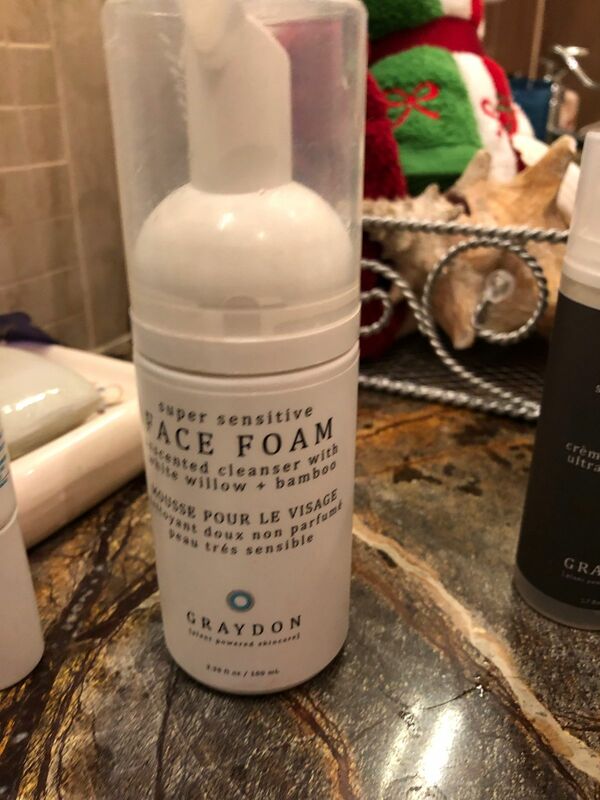 I have been using this product as a nighttime cleanser for a few weeks and love how it removes make up easily, like my Graydon Glow and Boy Brow. It leaves leaves my skin feeling soft and clean without over drying. Two pumps of the product is all I need for extra clean feeling, one pump of product for days when I don’t wear make up. Definitely going to be a staple in my daily skincare regimen! Hi Jessica, so glad you are enjoying our Face Foam! It's such a great cleanser for sensitive skin. Make sure to try it with our Bamboo Charcoal Konjac Sponge for the ultimate deep clean.